This constitutes the agreement between student/responsible party and Pirouette Dance Academy for all classes and/or activities the student is pursuing at or with Pirouette Dance Academy. I authorize Pirouette Dance Academy, Inc. to charge the agreed amount listed to my credit card provided herein. I agree that I will pay for this registration in accordance with the issuing bank cardholder agreement. Tuition is not refundable for any reason. Tuition is due the first class of the month and is considered late after the second Saturday of the month. Tuition WILL incur a $15 late fee after this time. Please note if there is no class for any reason you are still responsible for payment to avoid a late fee. We accept Cash, Check, Money Order, Visa, Discover, or MasterCard. Tuition stays the same no matter how many weeks are in the month. JUNE TUITION MUST BE PAID BEFORE RECITAL TICKETS MAY BE PURCHASED. After one month of unpaid tuition if you have not made an effort to contact us or your child has not been present in class you will be terminated as a customer of Pirouette Dance Academy. If your child is still participating in class once tuition becomes unpaid for one month your child must sit out of class until account made current. Once you bounce a check for the season unfortunately we can no longer accept check as a form of payment from you. All dancers are expected to come to dance class in the proper attire. Girls-Black leotard and tan/pink/black tights with hair neatly pulled back. Black cover ups are permitted during warm up only. Ballet skirts can be worn during ballet class. Teal studio t-shirts and cover-ups are also allowed. Hip hop classes will be allowed to wear black pants if desired. Boys- Black pants/shorts and plain black T-shirt/Tank. For shoes please see shoe list. ANY STUDENT WHO HABITUALLY VIOLATES DRESS CODE WILL NOT BE ALLOWED TO PARTICIPATE IN CLASS. Please be aware appropriate behavior is expected at all times from all people in the studio including but not limited to, students, siblings, parents, relatives, friends etc. Yelling, cursing or any form of inappropriate behavior will result in removal from the studio and possible termination. Any tuition paid is not refundable. If you have already paid on costumes and become terminated due to any of the above that money is also not refundable. From time to time an outside photographer or videographer or staff of Pirouette Dance Academy may be hired to take photographs or videotape recitals, performances, or classes. We do videotape the dances as a helpful tool for parents and students to review choreography at home. Also, we do many activities at Pirouette Dance Academy such as a Holiday Party, Parades, outside performances, etc. and we do take pictures at these events. By initialing here, you herby consent for such professionals to take photographs or videotape footage of your child during recitals, performances, and classes. Pirouette Dance Academy will own the intellectual property rights to said photographs and/or videotape footage and may use them for future brochures, advertisements, etc. Parents of students in Creative Movement 1 & 2 are asked to stay for the duration of the class. If this is not possible please let the staff know. Also, for the student's safety if someone other than a parent or close relative is picking up a student please make the instructor aware. With the parking lot being a little busy at times, please drop off student as close to the door as possible. Also, if older students are left here unattended they will not be allowed to leave the studio unless we see them going to a parent's car for their safety. and from any and all claims, actions, causes of actions, demands, rights, damages, costs, expenses, lost wages and loss of services of any kind whatsoever for personal injury and/or property damage, known or unknown, which may result from my participation or child's participation in, preparation for, or any other activity/ies associated with Pirouette Dance Academy, Inc., and whether arising before, during or after such activity/ies. I further covenant not to sue any of the Releasees for or on account of any such injury(ies). 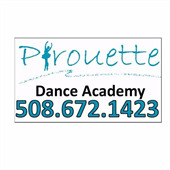 I hereby acknowledge that I or my child is physically and mentally capable of participating in classes at Pirouette Dance Academy, Inc. and the activities associated therewith. Furthermore, I am familiar with the risks incidental to participation in such dance or events, and assume full responsibility for the risk of bodily injury or property damage due to the inherent risk of dance and such activities while in or upon the premises in which the classes take place while for any purpose participating in the aforementioned activities, and hereby expressly waive, release and forever discharge all Releasees of and from any and all claims of any nature which may be occasioned by participation in these events. In further consideration of the publicity afforded to my child as a participant at the dance studio, I hereby grant permission to Pirouette Dance Academy, Inc. and their affiliates and promotional agencies to use my child's picture, name, likeness and/or voice in any and all manner and media (including but not limited to the internet) throughout the United States in perpetuity for the purpose of publicizing myself or my child's participation at Pirouette Dance Academy, Inc. and for marketing, promoting or advertising for the studio, without fee or payment of any kind, and hereby release all of such parties from any claims that I/we may have for invasion or violation of rights of privacy, rights of publicity or any other cause of action arising out of such usage. I hereby waive any right to pre-approve usage of my child's picture, name, likeness or voice before release or publication and agree that any such usage may be edited in our sole discretion. By enrolling at Pirouette Dance Academy, Inc. d/b/a Pirouette Dance Academy, you will be expected to perform in our annual Recital in June. YOU HAVE THE OPTION TO OPT OUT OF THE RECITAL AT THIS TIME ONLY. If you do not opt out now you will be expected to participate in the Recital and all related activities, including but not limited to, Rehearsal/Dress Rehearsal/all shows. The tentative date and venue of Recital 2019 will be announced. •	You will be required to purchase a costume for each genre of dance your child takes. Tentative pricing is $65-$75 per costume. CHECKS WILL NOT BE ACCEPTED AS A FORM OF PAYMENT FOR COSTUMES AFTER DECEMBER 1ST. •	You will have the option to pick your child's costume size based on their measurements or have the director choose it. There is a $10 exchange fee for any costume that you do not feel fits properly and wish to return. Ticket sales for Recital 2019 will be cash/credit card only and sold on a first come first serve basis on a designated time. Ticket sale date TBA. June tuition will be required to be paid before tickets may be purchased. Tuition stays the same no matter how many weeks/classes are in a month. Please understand that all of our students work together as a team to put on an amazing performance at the end of the year for all of us to enjoy so your commitment and dedication are of upmost importance. If students are absent on a regular basis it hinders the whole class and choreography. Some routines also require partners or assistants for stunts so if everyone is not present it would negatively impact others. Please be aware that excessive class absences will require mandatory private lessons which will cost anywhere between $25 & $30. If you are absent for a one month time period you will be terminated as a customer of Pirouette Dance Academy and will not be allowed to perform in Recital. Performing in Recital is a privilege and the staff of Pirouette Dance Academy has the right to revoke this privilege from any student at any time. We strive to push our students to their personal best and enjoy every moment of it. Knowing all of this please take special consideration when signing your child up for the Recital. PLEASE INFORM US VIA THE COMMENT BOX BELOW IF YOU DO NOT WISH TO HAVE YOUR CHILD PARTICIPATE IN RECITAL 2019! *PLEASE NOTE* Any registration received after January 1, 2019 cannot participate in the 2019 Recital.